A month is a good size for experimenting with life. This month, I’m focusing on having a place for everything and everything in its place. Brains are bad at recall. Infrequently-used items fade into the fog of memory, like the loyalty cards and IDs I stash in a sometimes too-secret place. Frequently-moved items end up with confused associations: did I leave my belt bag on top of the dresser, or is it on the kitchen table? Under stress, recall is an even more difficult task, and it’s easy to glaze over and miss something when you’re trying to think of where else it might be. There’s the classic advice to have one place for everything, and put everything in its place. This works if you have foresight, discipline, and an organized space. Our house looks more like like a Martha Stewart centerfold… the “before” picture. 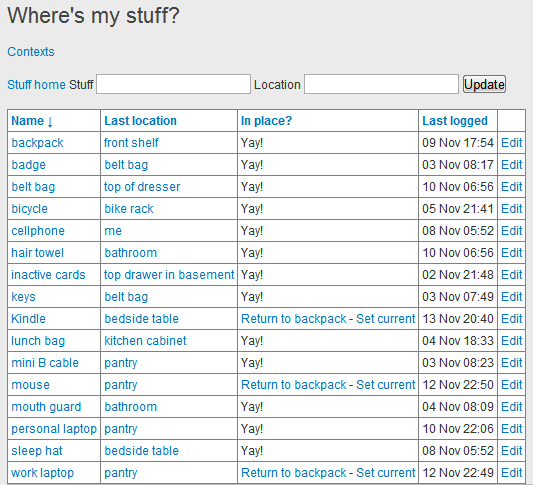 The detail page makes it easy to see where something is, change an item’s location or view other things that are associated with it. 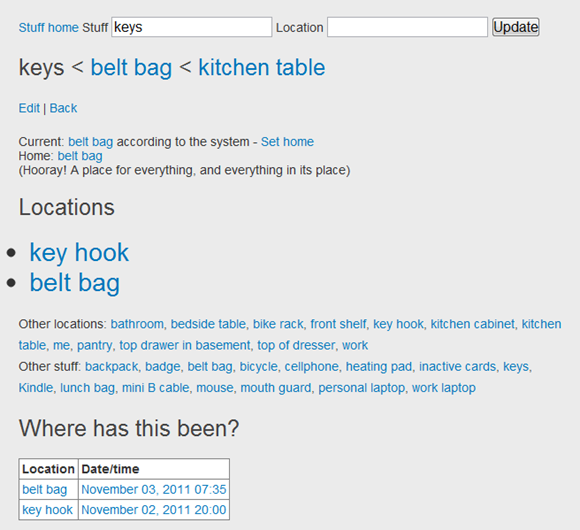 Here, my keys are in my belt bag, which is on the kitchen table. I’ve just added this idea of a context, which groups together things. This way, I can check whether everything’s in the right place, and I can mark everything moved in one go. Slowing down and tracking things might help me improve my peace of mind. Even if I don’t always update my system, I think seeing a list of possible locations will help a lot. 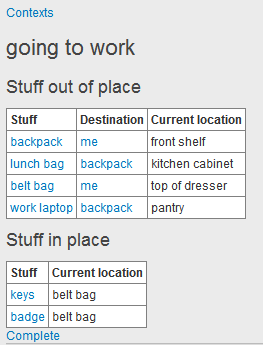 A table of stuff, current locations, and home locations will also make it easier to ensure that everything has a rightful place. I can identify things that are out of place and where they should be returned, which would be great for daily and weekly sweeps. I hope to collect interesting data over time. Maybe usage stats will tell me what’s worth improving or eliminating. Maybe this is something I’ll discontinue after a month, or maybe it’s something I’ll open up for wider use. Who knows? I’ll give it a try to work out the usage patterns, then maybe I’ll look into tweaking my personal dashboard so that people can try using it to track their own lives too. Like this? Check out my other self-tracking posts.